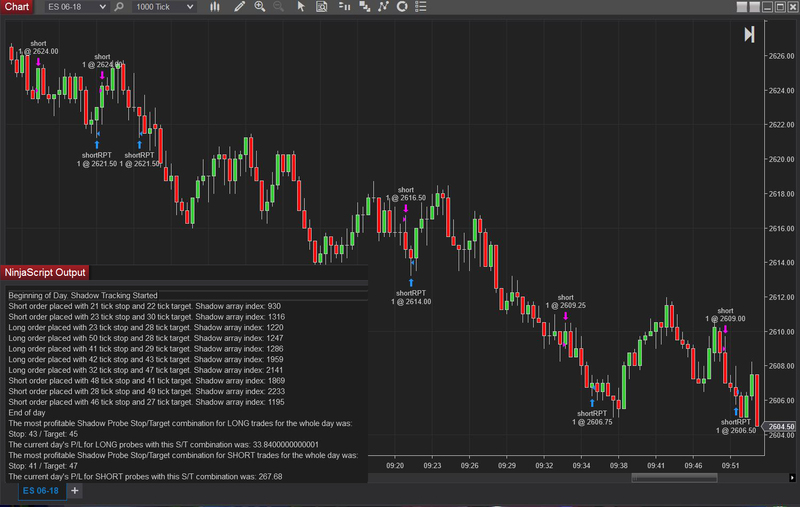 This NinjaScript strategy will place simulated trades behind the scenes to feel out the current market conditions. When your defined tracking time starts each day, the Shadow Probe will enter and track hundreds of simulated positions with every stop/target combination in a range you define (e.g. if you set the range to 2‐100, the Shadow Probe will run simulated trades with a stop/target of 2/2, 2/3, 2/4...... all the way to 100/99, 100/100. With this Shadow Probe data you will know the most profitable S/T combination for the day, the most profitable S/T combination under certain conditions (i.e. the S/T combo that performs the best when the ADX is at a certain level), the most profitable S/T combo over the last x minutes, and an infinite number of other ways you can think of to utilize the probe data. There's more information about how to tweak it and dial it in at the creator's page here.